Cleaning the gutter is important for smart home maintenance. Clogged gutters hinder rainwater from flowing through the downspout system properly and this can lead to pooled water around the house which can cause damage to the house’s foundation. What this translates to is a costly home repair. Other people are also hesitant to clean their gutters because this sometimes means climbing up the ladder. In some cases, this has caused accidents and even deaths. However, if you follow proper cleaning procedures and use the right tools for cleaning the gutter, the task of gutter maintenance can be a breeze. The gutter claw is an interesting tool that allows you to grab the debris out of your gutter easily. This tool isn’t actually used specifically for guttering as it is something that is meant to extend a person’s reach. People use these extra-long claw arms to help them pick things up at a distance. Handicapped individuals use these to help them grab things that are far away when they have trouble getting up. These can be pretty helpful for guttering if you want to be able to reach further away. If you have one of these gutter claws available to you, then you can reach debris that you couldn’t reach normally with your hands. You can use this to make everything go a bit faster and to avoid having to reposition your ladder so often. Depending on how adept you are at using one of these, this may feel very convenient or somewhat cumbersome. This is a potentially useful tool that you will want to consider if you don’t like having to reposition your ladder multiple times. 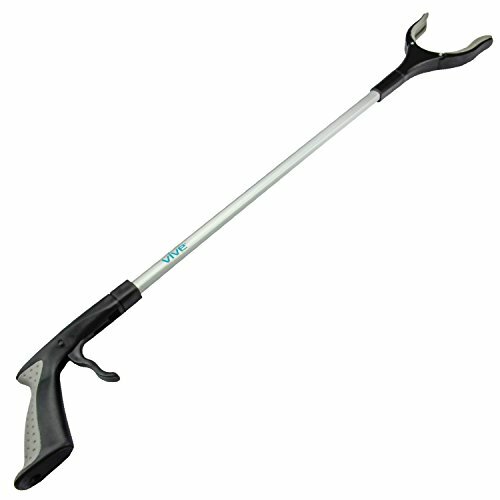 You might be able to use this claw effectively enough to clear out the entire gutter on one side of your home. Look into this tool further if you are interested in trying it out for yourself. A good ladder is an absolute necessity when you are performing guttering work. You are going to need to climb a ladder in most situations where you are cleaning out a gutter. Even houses that aren’t very tall are going to be too high for you to reach the gutters by conventional means. There are some telescoping wands that will allow you to do some guttering work without climbing a ladder but in most situations, you are going to have to get up there to clean things out properly. It is highly recommended to buy a durable and sturdy ladder. You want to be able to feel as comfortable as possible while you are doing the guttering work. This is going to be a process that takes some time and you will need to balance up there for a while. You are also going to need to reposition the ladder at certain points so going up and down the ladder, multiple times will be necessary. When you have a really good ladder to rely on, it isn’t going to seem nearly as scary as it could otherwise be. Of course, some people aren’t afraid of ladders in the slightest. Even if you are a very daring individual, it is going to pay to have a nice ladder. 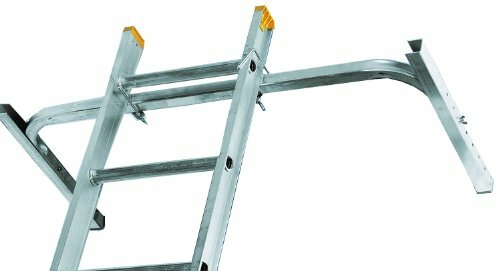 You can purchase a quality ladder that is made out of steel or aluminum at a fair price so you will want to look into the best options. It’s also a good idea to determine how tall your house is before you set out to buy a ladder. It may feel more comfortable for you to buy a ladder that is a fair bit taller than your gutters. This will allow you not have to climb to the very top of the ladder. Only having to climb to the middle of a ladder feels more natural and it is easier to balance everything this way. Climbing a ladder definitely isn’t something that everyone is completely comfortable with. If you fall into the camp of people who are afraid of heights, then you probably don’t look forward to having to clean your gutters. Depending on your feelings, you might wind up putting it off because the act of climbing a ladder makes you feel unsafe. There is a way that you can help to make your ladder climbing experience much safer, though. Purchasing a ladder stabilizer is going to be very helpful to you while you are guttering. It may not be possible to have someone there with you at all times to hold your ladder. If you live alone or if you simply don’t have someone who is willing to help you with guttering, then it makes sense to buy a ladder stabilizer. This handy tool is going to keep your ladder as sturdy as it can possibly be. This is going to make you feel more confident while you are up on the ladder. You will be able to enjoy a ladder that doesn’t wobble and this will make you feel much more at ease. The big reason why people fear climbing ladders is that they don’t want to fall and get injured. You will be able to balance on the ladder a lot more easily when you have a good ladder stabilizer to back you up. Using the stabilizer is quite simple. It will just attach to the top of the ladder and can then be affixed to the roof itself. This will let you go up and down the ladder without having to worry about it feeling shaky. You can get your guttering tasks dealt with far more quickly this way and you won’t feel nearly as intimidated by the ladder. You can purchase brushes that are meant for cleaning your gutters. These brushes are going to feature long poles with a brush attached to the end. You can run this brush through your gutters to clean out debris and dislodge stubborn leaves that are stuck to the sides of your gutters. It is a very convenient tool that many people turn to when they are in need. The sturdy aluminum pole on this brush is going to make cleaning your gutters pretty simple. It is rigid enough for you to force it through debris that is stuck really badly. This brush isn’t quite long enough for you to be able to use it without climbing your ladder so you will need to get up there to use this properly. Once you are in the right position, it will be a very useful tool that will allow you to clear your gutters out efficiently. This tool might be best used in conjunction with other guttering methods. You may want to remove some of the debris with your hands as well as using water to clear out some of the finer debris. The brush is great for dislodging debris but it won’t be able to pick the debris up to have it removed. You will need to have other methods available to you to use in tandem with this brush. Making use of a gutter wire brush is an excellent preventative measure that you can take. You will be able to stop a lot of the clogging problems that occur in your gutters by installing one of these brushes. You simply need to get on your ladder and place one of these gutter brushes in the gutter itself. It will prevent debris such as leaves from getting into the gutter. The reason why you do this is in order to allow water to continue to flow through the gutters. Your gutters need to remain unclogged in order to function properly. They are there to protect your home but when they are all clogged up, they aren’t able to do the job that they are meant for. Thankfully, this wire gutter brush is going to be able to make a big difference. You might think that having the brush there is going to clog up the gutters as well. This actually isn’t the case because water is able to flow around the wire brush. This makes this tool a very useful ally to you in your fight to keep your gutters clean and clear. You won’t have any trouble installing these gutter cleaning brushes so it is a worthwhile method to consider. The problem with the gutter wire brush method is that it isn’t going to work perfectly. It can prevent a significant amount of debris but there is no way for it to prevent debris from forming in the gutters completely. You will still need to clean your gutters from time to time. Using this method will make it easier to use running water to clean your gutters so keep it in mind as an option that can be convenient for you. Gutter cleaning scoops are going to prove incredibly useful to you. If you are the type of person who doesn’t like the idea of grabbing onto the debris in your gutter with your hands, then having access to a scoop is going to be essential. You will want to buy a scoop that is specifically meant for guttering. This is going to fit inside of your gutters neatly and will allow you to make quick work of any debris that you find. These gutter scoops are a very convenient guttering solution that you should consider. They are very cost-effective so you won’t have to spend too much of your hard-earned money in order to buy one. It will work very well as a tool that can scoop out various types of debris. Maneuvering it into the gutter will always feel very natural and it will be rigid enough to allow you to hold heavy loads of debris when necessary. Some people are torn on whether or not these gutter cleaning scoops are worth the small investment. It is definitely true that you could simply use your hands to do the work that the gutter scoop is doing. In fact, some people are more comfortable using their hands to do this job as they have an easier time telling where the debris is located. Others find these scoops to be very convenient because they allow them to be able to reach further than they would be able to with their hands. Consider your feelings on the issue before making a purchasing decision. Gutter cleaning scoops don’t cost much money at all so you won’t have to break the bank to get one of these. It can be useful to you but it just depends on whether you would rather use your hands. 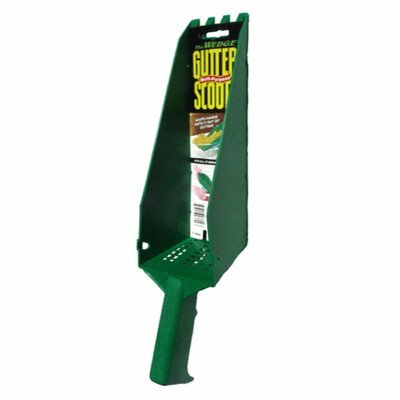 Whatever your feelings on this tool are, gutter scoops have proven to be popular guttering tools that are used by many people. There are many people who use their garden hoses to try to clear out their gutters. This is a pretty good solution that you will want to make use of if you don’t have access to a pressure washer. The amount of water pressure that a garden hose can put out is far less than that of a pressure washer but it can still be effective at dislodging debris. You will want to make sure that water can flow through the gutters as it is supposed to so using a garden hose on your gutters at some point in the cleaning process is highly recommended. You don’t need a special garden hose to do this job. The same garden hose that you use to water your lawn and garden areas will work perfectly fine to do this. Simply taking it up the ladder and using it to blow away debris will work pretty well in many situations. Results may vary depending on how clogged your gutters are, of course. Even if you intend to do all of your guttering by hand, you will want to use some water to get rid of some of the finer debris. Using your garden hose in tandem with other guttering methods is a great idea. This is going to ensure that water is capable of flowing properly through the gutters and you can keep them as clean as you possibly can. Handling your garden hose while balancing on your ladder shouldn’t be too difficult as long as you are comfortable on ladders. It is possible to purchase certain extensions for your garden hose as well. Some people buy wands that connect to the garden hose and these allow them to run water through their gutters without having to climb so high. If you are afraid of using your ladder, then this is going to be worth looking into. Otherwise, a traditional garden hose is going to work just fine for your purposes. One thing that you will want to make sure that you have while cleaning your gutters is protective gloves. You may not be able to completely avoid getting your hands dirty while cleaning your gutters if you don’t have access to a good pair of gloves. There are going to be situations where you will need to climb your ladder and remove debris from the gutters by hand. This may not be the most desirable situation but it is going to be the most efficient way to remove certain types of debris. Having a good pair of gloves to rely on is going to make this process seem to be not too big of a deal. Most people don’t want to use their bare hands to clean out their gutters because this is going to feel pretty nasty. It’s also a good idea to use gloves because you don’t know what exactly is in the gutters that you are cleaning. There could be things that could harm your hands if you don’t have the right protection so it just makes sense to wear the gloves. Luckily, getting a good pair of protective gloves isn’t going to be difficult at all. Some people use the same type of gloves for guttering that they do for gardening. Regardless of what types of gloves you decide to purchase, you will be able to feel much better about the guttering work with them on. It will make it feel more natural and you won’t have to worry so much about what you’re touching. You can find good pairs of protective gloves at most major retailers. Gardening gloves will work well but you can purchase something that is thicker and more protective if you would like. Just make sure that you have your gloves on before you get to work. It will keep your hands safe and you will be able to work more swiftly. You might already have a pressure washer somewhere in your home. People buy pressure washers so that they can clean off their decks and ensure that their siding will look as nice as possible. You may not think of pressure washers as something that you would use to clean out your gutters but these can actually do the job quite nicely. You see, pressure washers are capable of shooting out water at a high velocity and this can dislodge the debris that is clogging up your gutters. It is possible to use your pressure washer as is to clean your gutters out in certain circumstances. Depending on the style of pressure washer that you have, you might be able to reach your gutters while standing on top of a ladder. This isn’t always going to be the case, though. Some gutters will be too high for pressure washers that have shorter hoses and this makes cleaning gutters impractical. You don’t need to give up and buy a new pressure washer as you can simply purchase a gutter cleaning attachment for your existing pressure washer. This is a really convenient way to be able to clean out your gutters. The gutter cleaning attachments are very affordable and you will be able to make use of them quite easily. This will help you to get your gutters unclogged and everything should go well. It is possible that your gutters will be so clogged that you will need to remove some of the debris manually. People who haven’t cleaned out their gutters in a very long time will have a tough time getting the debris cleared in some situations. In this case, you will want to climb your ladder and remove some of the debris by hand. Your pressure washer will prove to be very useful during your time cleaning your gutters but you may need to get your hands dirty from time to time still. Using a telescoping water wand is a great idea when you want to attempt to clean your gutters without having to climb on your ladder. This wand is able to adjust to reach your gutters and you won’t have too tough of a time getting it where you need it to go. Depending on how high your gutters are, this could be a very good solution for cleaning them out in a safe fashion. Many people like to be able to avoid climbing ladders when they don’t have to so it is worth looking into if you have an aversion to heights. This telescoping water wand can produce water in several different patterns. The purpose that it is intended for is to water plants but many people have taken to using these to clean their gutters out. Running water down your gutters is sometimes enough to dislodge any debris that is causing problems. Depending on how badly your gutters are clogged, this may not be the ideal solution. This is a method that you will want to consider but it is important to understand that this may not work as well as you would like. It has the potential to work well but it will depend on certain factors. If you want to make use of this method effectively, then you should try to clean your gutters as often as you can. Preventing the gutters from getting too bad will allow the water to work as you are intending. Thankfully, this telescoping water wand is very cost-effective. You won’t have to pay an exorbitant price to get one of these so it is practical if you want to try this out. It might not replace getting on a ladder and removing the debris by hand but it is something that you can try. For some people, avoiding having to climb ladders at all costs is a necessity. Making cleaning your gutters as simple as possible is likely going to be your goal. Cleaning out gutters isn’t a fun experience by any stretch of the imagination but it definitely needs to be done. In order to streamline the entire process, it is possible to use a blower to clean out your gutter very quickly. This may not work well if your gutters are very packed with debris but it can be an effective method in many situations. Using a blower may require you to buy some special attachments so that it can work properly in your gutters. This isn’t the case with the model being shown off here. This particular blower is capable of cleaning out your gutters and removing the debris very effectively. It is powerful enough to blow out wet leaves from your gutters and you will be able to use this quite easily. Some people will not like having to balance on a ladder while using a tool such as this. It can feel a bit cumbersome depending on how much upper body strength you possess. Luckily, the blower isn’t all that heavy. It has a lightweight design that shouldn’t feel too tough on your arms while you’re cleaning out the gutters. It might be a good idea to have someone there to watch over you while you are balancing on the ladder with your blower. Safety is very important and taking precautions is better than being hurt due to being too eager. Whenever you are working on top of a ladder, it is smart to have someone around to assist you when you need help. This just makes things easier and it gives you more peace of mind.